In 2009 President Obama won the Nobel Peace Prize but back then he didn’t really deserve it. In hindsight, most agree that the voters in Stockholm, or Oslo, wanted [a] to stick a thumb in the eye of “43”, George W (the “decider-in-chief”), and [b] they wanted to send a message to the new president that much was expected of him, particularly in the area of . . . well, peace. Six years later, those Scandinavian voters are beginning to feel relief, or justification, or satisfaction. Last night it became clear that President Barack Obama has opted for dialogue rather than sabre-rattling. He’s chosen to change the course of political thinking rather than be bullied into another war. He’s decided to deal with the world as it is, and not simply pro-long another stalemate. Feigning deafness has not been an Obama trait. Thankfully. After almost two years of talks—six-party talks, aka negotiations, but in reality talks primarily between America and Iran—the deal is about ready. Ready for supporters to breathe a little easier, and ready for the guaranteed opposition from the GOP candidates who wish to be president. 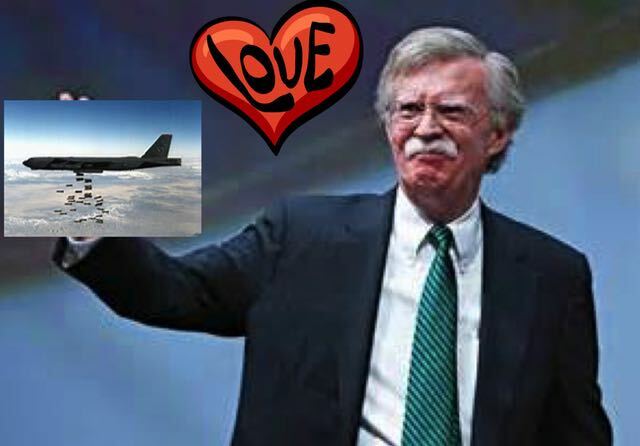 Of course, Bolton neglected to deal with the reality that Iraq was never a unified country, but a creation of the post-World War II exercise in line-drawing by the winning powers, and he ignored any history of the region. Bolton also failed to mention that Syria was no military match for Israel and retaliation was highly unlikely. And in March 2015 he hoped no one would recognize that Iran is a unified society, with a long (long as in thousands of years) history. Iraqi and Syrian citizens were never likely to rally en masse to a defense of their state, or their fearless leaders (respectively, Hussein and Assad). Consequently those two countries are in chaos and Iran as yet has not been attacked by ISIS. Iran’s population is, well, Iranian, and will certainly rise to any invasion, or respond to any attack, by ISIS or the United States. The GOP would like to keep the status quo. See how well that worked with Cuba? For the GOP it’s better to act like a 5-year old: stomp your feet, hold your breath, and refuse to speak with a nation 90 miles from Florida. That certainly made the world a better place. Now Iran is the “new” Cuba. So instead of a rational, reasoned approach to evaluating the Iran treaty, it’s all about sabotage. Death by a thousand insults. For the GOP crazies, the time has come to ratchet up the verbalized venom, and for their conservative collection of Daddy Warbucks-like supporters to throw a couple of hundred million dollars into media-buys denouncing President Obama, the Iran agreement, and the Iranian people. As John McCain sang in 2007 (“Bomb, Bomb, Bomb, Bomb, Bomb, Iran“), eight years later John Bolton lectured that it was better to bomb Iran than, well, anything else. If that’s the best the GOP can do, the electorate has to understand that war is their preferred Republican Party option. That’s it. At least it makes elections easy. Vote for the GOP and it’s a vote for war. Vote for Democrats means voting for rational discourse and, perhaps, a more peaceful world. Nothing is that easy, but the GOP makes it look that way. Time to work for peace, not scream about bombing Iran. PRIME MINISTER BENJAMIN NETANYAHU: “The deal is ‘[an] historic mistake for the world’ and will allow Iran ‘‘to continue to pursue its aggression and terror in the region.” And so says the leader of a nation with 100-200 nuclear weapons of its own, and a stated preference for war. Time for BB to just shut up and stop encouraging its ally, the United States, to launch a preemptive war on Israel’s behalf. SENATOR LINDSEY GRAHAM: “This is a terrible deal. It will make everything worse and I live in fear that we have set in motion a decade of chaos.” NOTE: Look for my separate blogpost on this idiotic politician’s views. SENATOR MARCO RUBIO: “It will then be left to the next president to return us to a position of American strength and reimpose sanctions on this despicable regime until it is truly willing to abandon its nuclear ambitions and is no longer a threat to international security.” NOTE: Senator Big Gulp whose parents, according to him, fled the Castro regime’s takeover in Cuba years before Castro ever came to power. Very prescient parents. . . . Now he wishes to impress us with his knowledge of the future of Iran. His views are much more appropriate for Mystery Science Theater 2000 rather than reality.